Japan is heavy on all our minds in the wake of the massive earthquake and tsunami that has devastated the country’s northeast region. While I worry with the rest of the world about the fate of the thousands of missing people, nuclear power plants on the brink of meltdown and the widespread destruction of homes, towns and farms, I’ve also been wondering about some of Japan’s wild creatures, and how they have weathered the upheavals. Tectonic activity is part of Japan’s dramatic natural geography, and along with seismic activity we often find geothermal features. The country’s popular “onsen,” bathhouses built for restorative soaking, are built over volcanic springs. But it’s not just the Japanese people who enjoy the inviting hot pools. 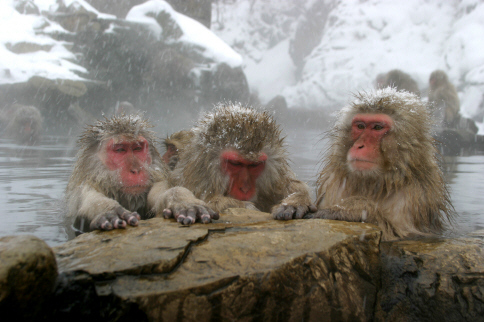 The famous snow monkeys of Nagano’s Jigokudani Yaenkoen Park also like to warm up in the steaming water, delighting visitors who come to watch them soak and preen. I wondered whether the earthquake might have affected their spring, concerned that it could have sent a surge of scalding water up from deep within the earth to harming the bathing monkeys. 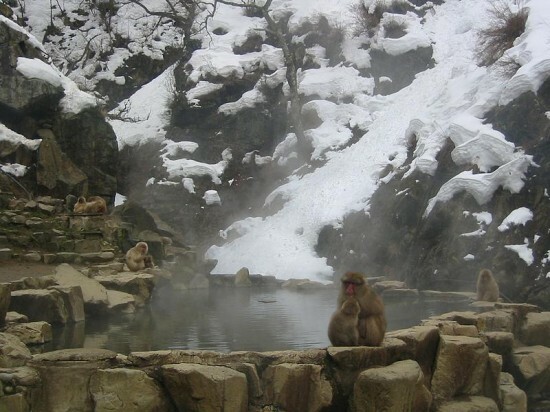 Fortunately, the Livecam that the park has set up to provide admirers around the world a daily glimpse of the monkeys confirms that they appear to be just fine – and their onsen looks unscathed as well. Once Japan is able to receive visitors again, one of the best things caring global citizens could do is to spend money in the country as travelers. As with New York after 9/11 or New Orleans in the wake of Katrina, tourism can be a vital contributor to recovery. You might consider a trip to experience Japan’s natural beauty, to observe graceful cranes and watch the snow monkeys’ antics up close and in person. The Japanese have long had an intimate connection with nature. Though Japan is a populous nation, nature thrives here untamed, in its peaceful beauty and sometimes in its fury. Thank you Wendy, I recently saw great fares to Tokyo and Osaka on China Air and that led me to think about the monkeys. I, too, am curious how close they are to the radiation sites. So great to see you writing on this! Provided nature cannot be exploited for easy profit. See, whale and dolphin slaughter. so they didnt get 3 eyes from this? I just came across this one, Wendy. It’s lovely — the pictures, the story, the reflection of so many good things in Japanese culture. Thanks for this reminder of a reality stronger than the devastation. 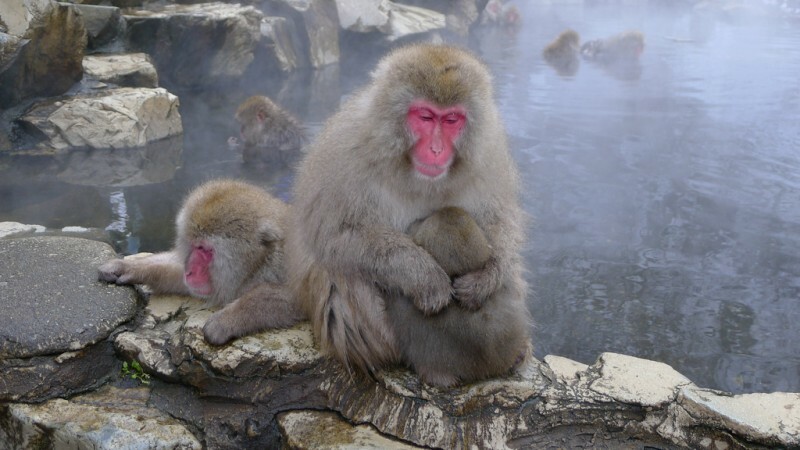 I am so happy to here about the snow monkeys. Do you know if there are any radiation problems in their habitat? I was also wondering about the giant salamanders that are only located in Japan and how they are doing? I think they are located along the coast if I remember correctly. I pray every day for the missing Japanese children and adults to be reunited with their loved ones, and for the injured and sick to receive the help they need. My husband worked for 3 years in New Orleans. I love New Orleans and the people but are so many differences in how the 2 cultures acted during natural disasters. We can all learn from the Japanese. My husband worked for 3 years in New Orleans. I love New Orleans and the people but are so many differences in how the 2 cultures acted during natural desaster We can all learn from the Japanese. I am so relieved. I was so hoping that was the case! Thanks for letting us know that the monkeys are okay!